Sometimes I’m reminded that when I’m away from home, I need to be extra careful to document my work so as to be able to cite my sources properly. Sadly I can’t do that with today’s treasure. Back in March of 2013, I went to the Family History Center in Powder Springs, GA. While there I found some fascinating things and I failed to document where I got them. One of the most interesting items was a letter to Mrs. E. B. Freeman, in response to a letter from her. I don’t know if the reply came from NARA, the War Department, or where but was signed by A. D. Hiller, Assistant to Administrator. Anyway, it provides details about William Freeman, a Revolutionary War patriot, his service and his family. As such it is a treasure to have found. I only wish I had properly documented my source for the document. 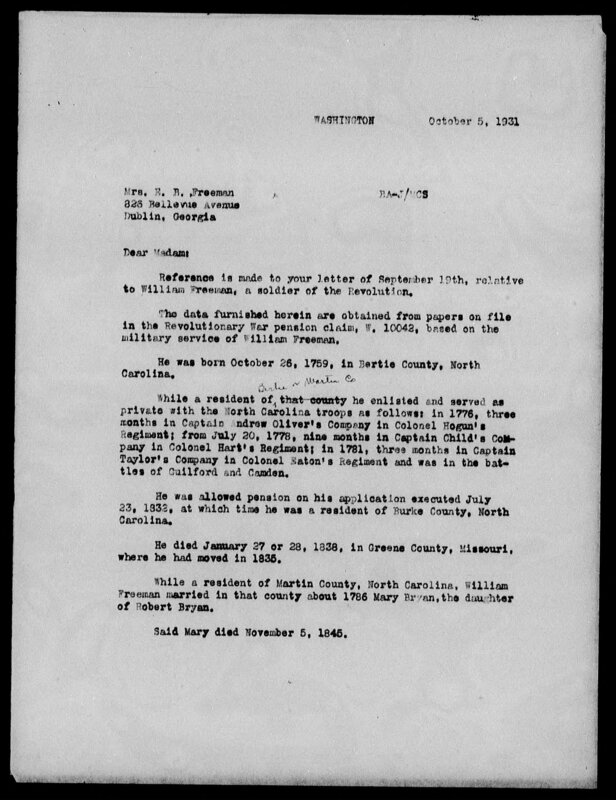 Reference is made to your letter of September 19th, relative to William Freeman, a soldier of the Revolution. 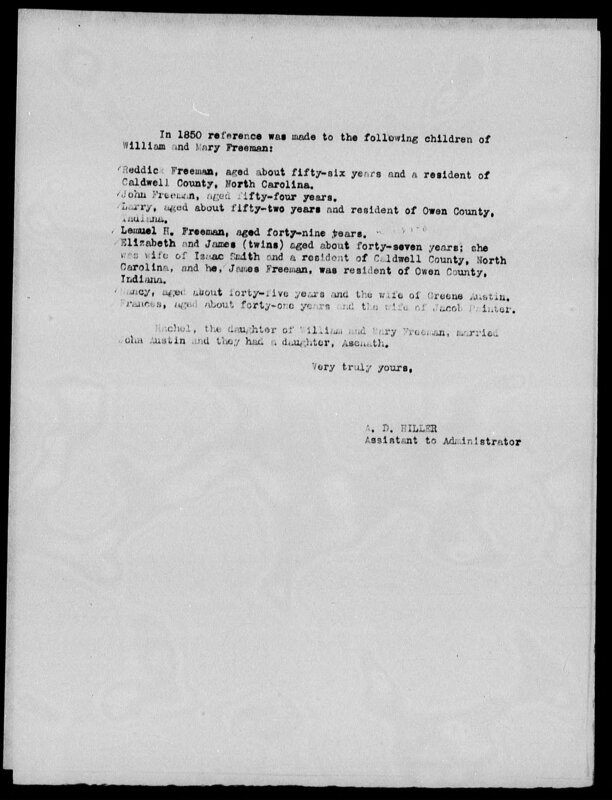 The data furnished herein are obtained from papers on file in the Revolutionary War pension claim, W. 10042, based on the military service of William Freeman. He was born October 26, 1759, in Bertie County, North Carolina. While a resident of Bertie or Martin Co., he enlisted and served as private with the North Carolina troops as follows: in 1776, three months in Captain Andrew Oliver’s Company in Colonel Hogun’s Regiment; from July 20, 1778, nine months in Captain Child’s Company in Colonel Hart’s Regiment; in 1781, three months in Captain Taylor’s Company in Colonel Eaton’s Regiment and was in the battles of Guilford and Camden. He was allowed pension on his application executed July 23, 1832, at which time he was a resident of Burke County, North Carolina. He died January 27 or 28, 1838, in Greene County, Missouri, where he had moved in 1835. While a resident of Martin County, North Carolina, William Freeman married in that county about 1786 Mary Bryan, the daughter of Robert Bryan. Said Mary died November 5, 1845. Reddick Freeman, aged about fifty-six years and a resident of Caldwell County, North Carolina. John Freeman, aged fifty-four years. Lemuel H. Freeman, Aged forty-nine years. Elizabeth and James (Twins) aged about forty-seven years; she was wife of Isaac Smith and a resident of Caldwell County, North Carolina, and he, James Freeman, was resident of Owen County, Indiana. Nancy, aged about forty-five years and the wife of Greene Austin. Frances, aged about forty-one years and the wife of Jacob Painter. Rachel, the daughter of William and Mary Freeman, married John Austin and they had a daughter, Asenath.